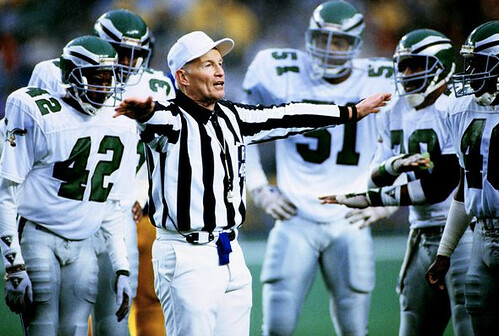 Twenty years ago this month, the Eagles came up with one of my all-time favorite uniform remembrances. After quarterbacks coach Doug Scovil passed away on December 9th, they memorialized him by adorning their helmet wings with strips of black electrical tape, which they wore for the final three games of the regular season and their one playoff game. Always fun to see the Eagles and Cowboys fighting, too. Couldn’t happen to two nicer teams. Meanwhile: New ESPN column today — look here. Raffle Reminder: Today’s the last day to enter the Uni Watch holiday raffle, if you haven’t already done so. Details here. I’ll announce the winners on Christmas Day. Uni Watch News Ticker: Check this out — a SuperSonics hockey jersey (with thanks to David Smajovits). ”¦ Lots of rumors about Arizona possibly wearing white helmets in the Holiday Bowl. ”¦ “The cycling blog occasionally features jerseys of the pro peloton from various years,” writes Sean Clancy. Here are jerseys from 1989. Scroll down on the blog’s home page to see more.” ”¦ Here’s a closer look at the U.S. Olympic hockey jersey (with thanks to Johnny Griswold). ”¦ Here’s the latest on the NBA’s new shooting shirts, which I first reported on in my NBA season-preview column two months ago. ”¦ Daniel Caceres found this Vikings helmet cooler in a relative’s garage. ”¦ Entertaining gallery of 1970s basketball coaching outfits here. ”¦ Really like the black-gold-white color pattern on this old basketball jersey. ”¦ Other eBay finds: a groovy old White Sox tee, an awesome football jersey in my favorite colors, and a basketball warm-up jacket that, in Mike Page‘s words, “has ‘Merry Christmas, Paul Lukas’ written all over it.” He might be right about that, although so far I’m resisting — better to give than receive at this time of year and all that. 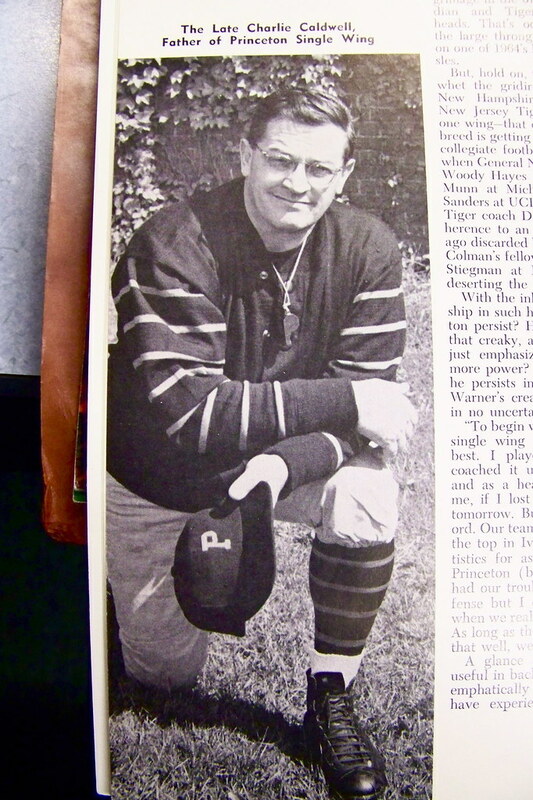 ”¦ Attention Matt Powers: Check out this shot of Charlie Caldwell, which Tris Wykes found in a 1964 Princeton/Dartmouth program. ”¦ Always fun to see a uniform show up on Antiques Roadshow (with thanks to Ian, who didn’t give his last name). 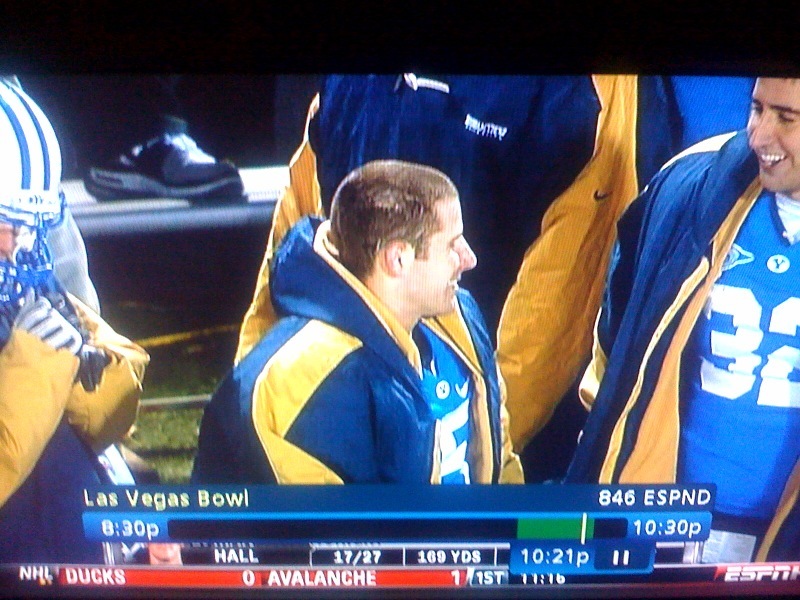 ”¦ BYU broke out the old blue/gold sideline capes from several years ago last night (as noted by Brian Deutsch). … Not uni-related, except for one small item, but this look back at the Pirates’ decade is really hilarious. And really sad (with thanks to Doug Keklak). Paul, if I didn’t know better I’d think you were a Giants fan. Those Cowboys uniforms look so much better than their current non-throwback blue uniforms. Always nice to see the announcers getting snowballs thrown at them too. The intricacies of the US hockey jersey are great for up close perusing, but we’re not wearing it and shopping at WalMart for all to see. [quote comment=”368234″]Always fun to see the Eagles and Cowboys fighting, too. Couldn’t happen to two nicer teams. Unless it was the Eagles and Niners. 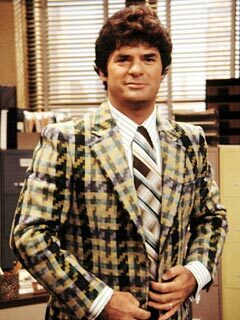 Not a coach, but a fine saleman. Cheap-shot Steelers? Bradshaw says so. in the video, the officials have different styles of numbers — 67 is a sans-serif, while others are block. Do the Eagles still make the Cowboys wear blue in Philadelphia? Uniform of the decade is……………….?? Back in ’81 Auburn had some deaths at the school and commemorated it by wearing black tape above the AU decal on the helmet. It also seems Tennessee did something similar after having coaches die maybe in the ’60’s. I couldn’t find any decent pictures of these memorials though. US Hockey jerseys: I like the look a lot…from far away. Don’t really like the “tatooing” and wish they’d gone with a normal star. REALLY like the NBA shirts…because they look like soccer jerseys. [quote comment=”368235″]Those Cowboys uniforms look so much better than their current non-throwback blue uniforms. I agree. I’d much rather see the silver number and stripe fill than the white. Those Philly unis own the current ones as well. Actually, I like the Jaworski era uni’s best and would like to see something new with those in mind…eliminating the black. That photo gallery of coaches in disco suits is classic. Check out #8, I believe that’s Jack Sikma sitting on the bench wearing Zappa sneakers. Am I remembering them correctly?! BYU had three different color schemes for last night. The players wore the royal blue jerseys, the coaches all had navy blue/white sideline gear, and the there were the capes with navy and gold. Not uni-related, except for one small item, but this look back at the Pirates’ decade is really hilarious. Now if we can get someone to throw snowballs at Matt Millen. aaaaahh, what great football/tv broadcasting back then. No logos plastered everywhere, no annoying animations (I’m lookin’ at YOU, Fox Robot! ), no constant barrage of fantasy stats. Just the game, as it should be. Already covered in Monday’s Ticker. Was BYU wearing throwbacks last night? Or have they returned to the royal blue colors of yore? [quote comment=”368252″]Not uni-related, except for one small item, but this look back at the Pirates’ decade is really hilarious. LOL! It’s equally sad that you have a manager whose entire tenure is remembered by ripping out first base and taking it back to the clubhouse upon his ejection from a game. This was a guy who in his press conference upon getting hired said the Pirates wouldn’t be an embarrassment under his watch. Five seasons, and 446 losses later….well, Legendary Lloyd still has those 5 HRs in one game when he was at the Little League World Series!!! This is what happens when snow shuts down the federal government on a workday – I miss all the news. Thanks, Paul. APPRAISER: Okay, so this is safe to say it’s from that era? You got a few condition problems with the jersey. There are some moth holes, some minor tears. It’s missing, I think, just one original button there, but all in all, it’s in pretty good shape for 1910. I mean, this is almost 100 years old. GUEST: Considering that my dad and his brothers wore it around for Halloween costumes and whatnot. Those are the throwbacks honoring the 1984 National Championship team they also wore against Utah. I’ve not heard anything about a switch back to royal blue around Provo. Yeah, I remember watching the ’69 Superbowl, Jets-Colts, in real-time, but it wasn’t until I watched a tape of it some 30 years later that it really hit home what a gaudy spectacle modern football broadcasting has become. *Sniff, sniff* Man I really miss sleeves on football jerseys. Heading out for the Great White North (Virginia) soon. Don’t think I’ll have access to the series of tubes for a few days so allow me to wish everyone a safe and happy holiday, whichever you choose to observe, if any. By this year’s standards, yes, they were throwbacks. Have no idea what their plans are for 2010.
btw, in my almost-asleep state last night I was running through the names of memorable BYU QB’s who’d worn royal & white with their fun-to-watch passing teams…and said both Detmers had gone to BYU. Well, that’s wrong, of course, and Kurt Ã…llen caught the mistake. Coy went to Colorado. Also, being awake this a.m., I now remember that the QB of the era I was missing in my memory sequence was Robbie Bosco. And there are still some I overlooked. No it isn’t, especially the good ones. Vern Lundquist and Terry Bradshaw made a pretty good team back in those days. 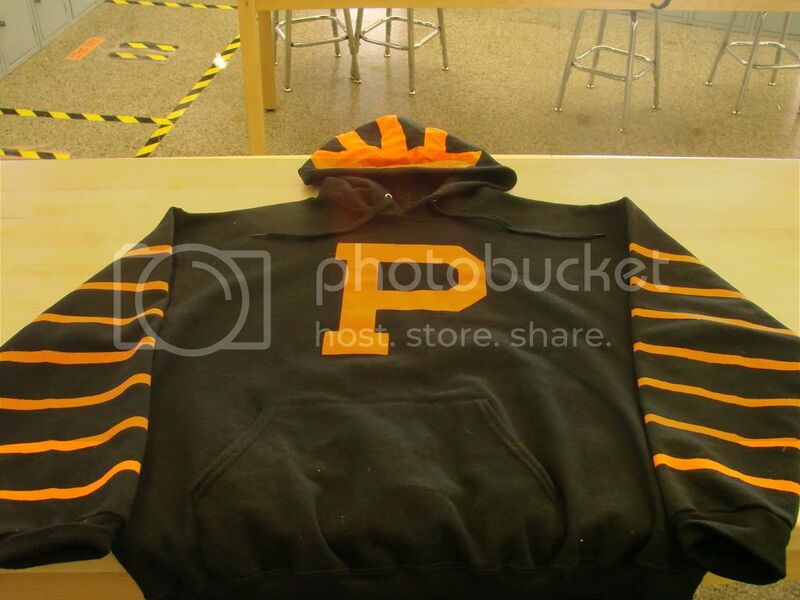 That Princeton sweater is GORGEOUS. [quote comment=”368245″]US Hockey jerseys: I like the look a lot…from far away. Don’t really like the “tatooing” and wish they’d gone with a normal star. Yeah, those shooting shirts do look nice. Always nice to see a V-neck shirt available these days. I’m not sure any school ever had as good a run of QBs as BYU did from 1977-1990. It may have had a lot to do with the offense (even Houston had a couple of Heisman Trophy winners running that offense), but those QBs made their mark in the pros too. Will always think of the Holiday Bowl with BYU. They won a national championship there and had one of the all-time great comebacks against SMU there too. That was back when that bowl was a really big pre-Christmas game. It still is (e.g., TCU-Boise last year), but it shares the stage with others. [quote comment=”368271″][quote comment=”368245″]US Hockey jerseys: I like the look a lot…from far away. Don’t really like the “tatooing” and wish they’d gone with a normal star. Clarification: Houston had one Heisman winner (Andre Ware, 1989). David Klingler, the following year, did not win it but ran up some pretty good numbers. [quote comment=”368270″]That Princeton sweater is GORGEOUS. Love that jersey. Always will. (sigh) Wish I’d gone to school there. Was accepted, just chose Minnesota cuz of the highly-regarded J-school. And far less expensive, of course. [quote comment=”368258″][quote comment=”368252″]Not uni-related, except for one small item, but this look back at the Pirates’ decade is really hilarious. [quote comment=”368267″]Heading out for the Great White North (Virginia) soon. Don’t think I’ll have access to the series of tubes for a few days so allow me to wish everyone a safe and happy holiday, whichever you choose to observe, if any. [quote comment=”368277″][quote comment=”368258″][quote comment=”368252″]Not uni-related, except for one small item, but this look back at the Pirates’ decade is really hilarious. You really needed to follow the Pirates to appreciate how sad, funny, tragic, dismal, and totally spot on that article was. that Eagles clip brings back a lot of memories. white, brown, simmons, waters, golic, joyner, allen, hopkins, zordich, thomas, etc. how they never even managed a playoff victory under buddy is staggering. For some reason, I just had a vision of future elections being determined “American Idol” style. Now my head hurts. They did. And the Canadian Olympic hockey team has adopted it, also. They are way better than soccer because they don’t have some random company’s name plastered across the front. I think these shooting shirts could be decent sellers for those who want to wear something of their favorite player, but want a normal shirt instead of a sleeveless jersey. It’s actually not a dumb idea! God I HATED LaRoche. At first I was furious when I saw him on the list, then I started thinking of the other 1Bs that have been through town. Darryl Ward? Craig Wilson? Sean Casey? Randall Simon? Two examples of some of the often-hilarious NFL and college-themed hats found on this web site. Worth every minute exploring. [quote comment=”368273″][quote comment=”368252″]Not uni-related, except for one small item, but this look back at the Pirates’ decade is really hilarious. DUDE! Camera Day! I went to what I think was one of the last years they did that. I have the photos somewhere. I can’t pinpoint the exact season, but it was in the Bonds/Bonilla era. I’m going to have to find those photos and scan ’em! It must not be a heavily publicized logo, b/c I don’t remember seeing it, but according to Chris Creamer it’s been around since 1997. Wow, I had totally forgotten that Cunningham used to punt and Bradshaw used to be a color commentator. Cool clip! You really never know what you’re going to see when you come to Uniwatch each day! I’ve got a cap that was a giveaway at a Cubs/Sox game about 5 years ago. Because They Couldn’t All Wear His Jersey . . . It seems that beer bottles were into the “black stripe” thing as well. Check out the MGD commercial at 3:06. There is a black stripe on the neck label (probably a shadow). You’re right. In fact, I’d like to see this idea – t-shirts that look like jerseys, right down to the trim. Then you’d have the Patrick Ewing look. Actually, I want to DIY that Villanova Ed Pinckney jersey in the same manner. Yeah, he didn’t wear a t-shirt underneath, but I still want to do it. You know, if they made t-shirts like this, they could get really creative. Make the sleeves match the skin color of the player…maybe even print his bicep tattoos on there. I wouldn’t buy one with tats on it, but I bet a lot of people would. [quote comment=”368289″][quote comment=”368273″][quote comment=”368252″]Not uni-related, except for one small item, but this look back at the Pirates’ decade is really hilarious. That was fun. I got to within three feet of Willie Stargell – close enough to shake his hand, but I opted for getting a really good closeup photo instead. It’s around here somewhere. …as if it’d be any different than what we already have. If anything, you’d get more voters. Also some good shots of the Twins’ logo stirrups and the White Sox shorts. Anyone notice that picture 11/16 on that SI 70’s coaching eyesores captions Bob Slick? Who that hell was that??? That is Bobby “Slick” Leonard, coach of the Indiana Pacers. duh. Back in the late 90s, someone was forced to stop selling a long-sleeve T-shirt (without Rodman’s permission) that was patterned after all of Dennis Rodman’s tattoos. Good idea and they looked pretty good under Rodman jerseys, but the shirts would have looked better if it they had been brown instead of white. Here’s the complaint that was filed on Rodman’s behalf. [quote comment=”368250″]That photo gallery of coaches in disco suits is classic. Check out #8, I believe that’s Jack Sikma sitting on the bench wearing Zappa sneakers. Sikma is wearing Converse… perhaps you mean his neighbor to the left, can’t tell what those might be. Bat signal goes out for Powers. I’m not talking about the dang shirt brand that is gonna be there no matter what (good or bad). I’m talking about what soccer does with some completely random sponsor hijacking the uniform. It happens in MLS too. [quote comment=”368269″][quote comment=”368235″]Those Cowboys uniforms look so much better than their current non-throwback blue uniforms. well…. maybe Vern and Terry were interviewing Santa Claus in the booth. [quote comment=”368304″][quote comment=”368250″]That photo gallery of coaches in disco suits is classic. Check out #8, I believe that’s Jack Sikma sitting on the bench wearing Zappa sneakers. bata, maybe. There’s a shadow that appears to aid a tail to their flying wedge logo. you surprised me, i was expecting a picture of el gran Roberto. jejeje. Phil unearthed this version of that same shot a month or two ago. You can see a completely different sock pattern on Moe Drabowski (tucked in shirt). I knew Randall punted, but didn’t know how much. He actually punted 20 times for a 44.7 yard average. In 11 years with the Eagles, he punted 12 times and averaged 51.7 yards. In three years with the Vikes he punted eight times for a 34.3 yard average. You’d think someone with punts of 58, 65, 80 and 91 yards would be a full-time punter, but according to this http://www.the700level.com/2009/06/randall-cunningham-punter-extraordinaire.html he wasn’t consistent enough. I can’t be arsed to look it up, but I recall Randall nailed like a 90 yard effort (aided by a tremendous bounce, obviously) vs. the Giants. Not sure if this got posted yet, but ESPN Soccernet posted an article featuring the worst kits of the decade. [quote comment=”368309″][quote comment=”368273″][quote comment=”368252″]Not uni-related, except for one small item, but this look back at the Pirates’ decade is really hilarious. He was great, but I was always a Stargell fan. One of the first games I ever saw, I yelled to him and he waved hi to me. Later he hit a home run and I said to my dad, “That’s going to be my favorite player from now on.” Didn’t know anything about him until that day, but apparently I made a good choice. Speaking of Roberto, notice how the scoreboard shows #21 in the “at bat” section? They used to do that before every game at Three Rivers, years after Roberto died. Don’t know if PNC Park does it, because I usually don’t get there until game time now. Braves agreed to terms with Troy Glaus. I guess he’ll wear #25, Andruw Jones old number. Was worn off and on by Barbaro Canizares, a AAAA guy. Could wear #8, too. 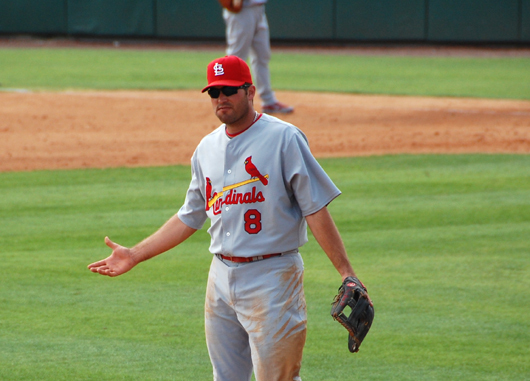 Glaus wore #25 with Anaheim, Arizona and Toronto, but wore #8 for the Cardinals. I believe that game was played the night before 9/11. [quote comment=”368316″][quote comment=”368309″][quote comment=”368273″][quote comment=”368252″]Not uni-related, except for one small item, but this look back at the Pirates’ decade is really hilarious. judging from the clothes and the hat you’re wearing… is that 78 or 79? You didn’t go wrong w/ the Great Willie either. i was a big Rennie Stennet (why? no idea:it’s a kid thing), lanky Kent and skinny Omar (& ex-Met Johnny Milner) fan in thoses days–but Rob will always have a corner of my heart. It’s okay, Jim. Nobody else does either. [quote comment=”368319″][quote comment=”368316″][quote comment=”368309″][quote comment=”368273″][quote comment=”368252″]Not uni-related, except for one small item, but this look back at the Pirates’ decade is really hilarious. That photo was 1980, because Willie was MVP in ’79 and I got the shirt the following year. My second favorite player was Al Oliver (I was so upset when he was traded to the Rangers), followed by Kent Tekulve (who ain’t so lanky now). Wiffleball used to be fun – I swung the bat like Stargell and pitched like Tekulve. [quote comment=”368321″][quote comment=”368316″][quote comment=”368309″][quote comment=”368273″][quote comment=”368252″]Not uni-related, except for one small item, but this look back at the Pirates’ decade is really hilarious. Really liked the gallery of 1989 cycling jerseys. It’s missing one notable team from that season, though; ADR, for who Greg LeMond rode and won the TdF. The only socks in that shot that the White Sox actually wore are those on the player in the shorts, who is, I believe (as I’ve mentioned before), Jim Landis…CF on the ’59 W-S team. Although it DOES look a lot like Roger Dorn. And as someone who had to look at those Twins’ powder blues year after year (esp. with the red hats), let me just say that anyone who thinks they ought to brought back is seriously deficient in the “what makes a good-looking uni” department. Those things were SO minor league looking. And still are. Just a disjointed hodgepodge. When left to their own devices over the past almost 40 years—as evidenced by the new road unis—the Twins organization always has been virtually taste-free (“Well, the sales rep said they were good-looking, and we didn’t know, so we took his word for it”). Metaphorically speaking, the Twins have always been the ones who show up to perform on “Dancing with the Stars” in their “Polka Time” costumes. Y’know, double knit blazers and plaid pants, white shoes…stylin’. The exception was the return to pins in ’87, which was designed in conjunction with their ad agency at the time. Such a shame. IMO it’s the best park in baseball. My high school football team (also the eagles, and also in PA) would get blacked whenever we made the playoffs. We had the exact same uniforms as Philly only cherry & steel, so I’m positive it was swiped directly from this. I completely forgot about that. Thanks. Since I know you’ve all been dying to see a picture of said cap, here ’tis. This has been probably mentioned before … what is the logo on Brett Favre’s cap during press conferences? Looks like Paul’s new column is up here. Nice piece. Let’s hope that secret stretchy jersey doesn’t become standard issue. As for the part about the Steelers jersey numbers, you picked a great photo to illustrate the less-than-tough look of the new font. Hines is tough, but that pose wasn’t. Nice to see a modern football player smile, though. In theory, I like the new font; but in practice, when the jerseys get pulled the numbers (especially the 1 and 7) look goofy. Imagine if they started wearing the secret stretchy stuff. [quote comment=”368282″]that Eagles clip brings back a lot of memories. Zordich didn’t come around until waaaay later. You know those “C” patches that team captains have been wearing for the past three seasons? The patch program is optional — the Packers, for example, have worn them only in playoff games. And a few other teams have occasionally gone without them. But only one team has never worn the captaincy patches: the Steelers. Uniqueness Factor: Go back and reread that last sentence. I don’t remember the Eagles ever wearing a Captaincy patch. Mostly because they designate different captains each week. Is it adjustable? If it is and it’s under 20 bucks, I’m there. If the Braves keep Jason Heyward in the minors to start the season, then their two backup outfielders on the 25-man roster will probably be Brandon Jones and Mitch Jones. That would mean 3 Jones for Atlanta. I know the Braves ditched the first-initials towards the end of Andruw Jones’ stay with the team, but with 3 guys, they might bring them back. I’d prefer a return of the vertically-arched lettering, but I don’t see that happening. No and no, i fear. However, for $24 you get a nice, low profile fitted thing. But the old gold color makes it very worthwhile. Just like ol’ Manny Sanguillen would have worn! I was clicking around the MLB.com shop site and that was at the top of the page. As per usual on the 23rd of December, I would like to wish the Uni Watch faithful a happy Festivus! My friends have been celebrating Festivus since the winter of 1999, and this year is no different. We even have a pole, airing of grievances, and the feats of strength. It’s a great friggin’ day! Any other Uni Watchers celebrate Festivus? [quote comment=”368350″]As per usual on the 23rd of December, I would like to wish the Uni Watch faithful a happy Festivus! My friends have been celebrating Festivus since the winter of 1999, and this year is no different. We even have a pole, airing of grievances, and the feats of strength. It’s a great friggin’ day! Did you get your pole from these fine folks? Which feats of strength will be you engaging in? Hope eveyone has a great holiday season, and hope you get something cool this year. OMG! That Philly-Dallas clip was so refreshing to watch. A minimal amount of space taken up on the screen by various logos and animations. No incremental breakdown of every player on the field every step and moves after every play. No “space aged” motorcycle helmets with visors and metal spider webs for facemasks. No dreadlocks or uncut hair cascading down the players backs. No eye black stickers with “shout outs” or tributes written on them. 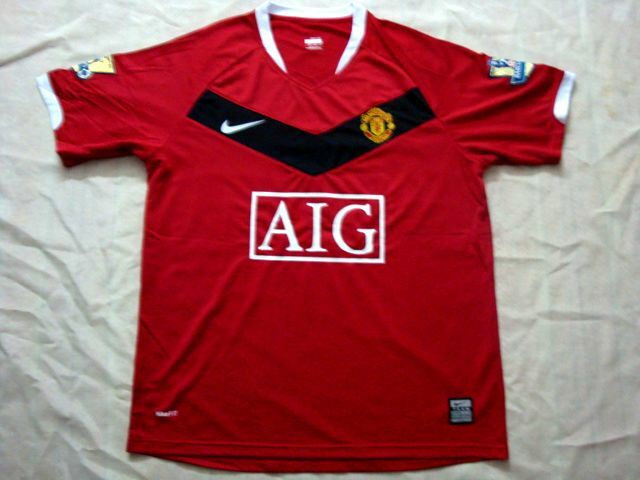 No jerseys stretched way beyond the fabrics capabilities. No bicycle pants cut above the knees. Actually being able to see stripes on the jerseys and socks. Every player on the team not having their own agenda to honor somebody, anybody, just to get attention. Arizona’s white Holiday Bowl helmets shouldn’t be much of a secret when they are (accidently) posting pictures of them on their equipment manager’s blog. Seems to me that a game against Nebraska is an odd time to break out a white lid. oops, my skimming skills ain’t what they used to be. somehow, this is evelyn wood’s fault. [quote comment=”368357″]Arizona’s white Holiday Bowl helmets shouldn’t be much of a secret when they are (accidently) posting pictures of them on their equipment manager’s blog. That is an AWESOME job…I would eat that up. BTW…They are practicing at USD…My junior year, we played the toreros in their beautiful Spanish Mission style stadium…great place. I would like to pass on the whole feats of strength, but WTF? BP caps are my grievance. [quote comment=”368359″][quote comment=”368357″]Arizona’s white Holiday Bowl helmets shouldn’t be much of a secret when they are (accidently) posting pictures of them on their equipment manager’s blog. Until a few years ago, Arizona had worn white helmets had worn white helmets for years. Not exactly a huge departure for them. Paying tribute to Pop Warner teams, I mean. anyone watching the cal v utah game? Heck, I thought this was a fan club for a certain “Gunsmoke” character!! On the majority of the jerseys being worn in the exhibition games for the World Junior Championships, the TV numbers on the sleeves are right on the shoulder. For hockey keeners like me, it looks a little off. Need I mention that the jerseys are made by Nike? Great pic. Those kind of gifts are what my childhood Christmas memories are all about. 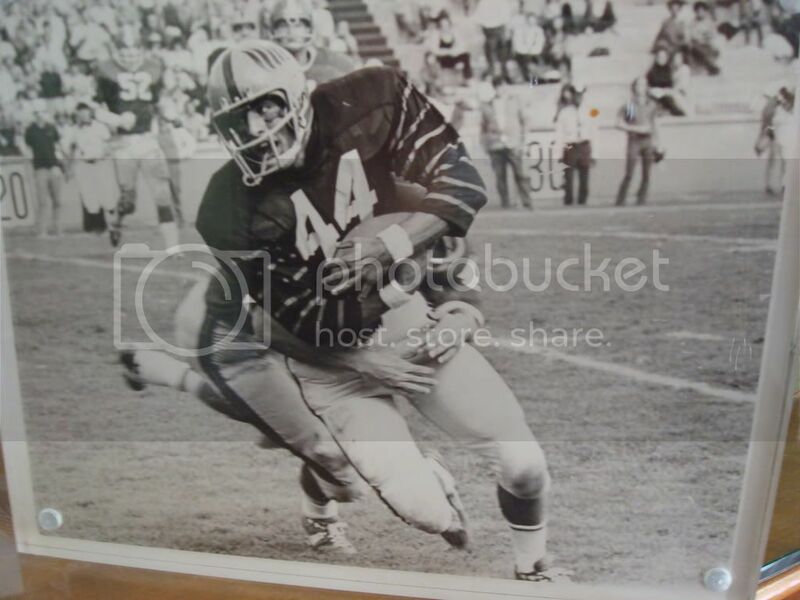 And a good variety there – Oilers,Bears,Browns – a Mike Phipps! [quote comment=”368355″]OMG! That Philly-Dallas clip was so refreshing to watch. You can make similar observations watching classic telecasts on MLB Network. Lowkey and quiet all the way – even some World Series games as late as the 70s and 80s. Just way less noisy in every manner. Are those BYU capes really capes? It looks like the player on the left has sleeves. A real cape wouldn’t have sleeves! [quote comment=”368363″]anyone watching the cal v utah game? You want a truly good looking game? Flip to NHL network. Hawks/Wings in Detroit — 2nd best possible uni matchup in the league (Hawks/Habs in Montreal being #1). At least it should be on the NHL network because that’s what it says in the program guide. It’s blacked out here because of the local broadcast. [quote comment=”368369″][quote comment=”368363″]anyone watching the cal v utah game? I’d venture to say the greatest disparity in uniform appeal was achieved in New York with the Rangers’ sweet blue jerseys vs Florida’s dismal effort at a white sweater. Slight bowl-game alteration to the field at Qualcomm… the stripe cutting through the words “San Diego” in the end zone is red, to match the Poinsettia Bowl color scheme, instead of its customary gold. [quote comment=”368368″]Are those BYU capes really capes? It looks like the player on the left has sleeves. A real cape wouldn’t have sleeves! You’re right…. they’re reverse snuggies. [quote comment=”368370″][quote comment=”368369″][quote comment=”368363″]anyone watching the cal v utah game? Not a huge fan of Festivus, but ya gotta like any holiday that includes the possibility of a pole dancer. [quote comment=”368374″][quote comment=”368370″][quote comment=”368369″][quote comment=”368363″]anyone watching the cal v utah game? The Slug is awful. Especially considering the Sabres have another logo lying around that’s only about 647,912 times better. can’t you just picture JTH on christmas morn? Maple Leafs have patches on breezers, but placement of Maple Leaf emblem is not consistent. In some cases ML appears on right leg when CCM logo on left leg. But in a few cases ML patch on left leg with no CCM patch. Although on Isles breezers CCM or Reebok logo on left leg. Compare length of orange sleeve on these guys. [quote comment=”368381″]Maple Leafs have patches on breezers, but placement of Maple Leaf emblem is not consistent. In some cases ML appears on right leg when CCM logo on left leg. But in a few cases ML patch on left leg with no CCM patch. Although on Isles breezers CCM or Reebok logo on left leg. Hockey pants are an interesting logo creep product. Most companies opt for only left leg and some sort on the high hip or tail bone pads which are usually covered. Tackla, however, plasters their logo all over the damn things. Having their logo on both legs always annoyed me because I like to see team logo on one leg. One of my two favorite Christmas movies. The other is Scrooged. [quote comment=”368383″][quote comment=”368381″]Maple Leafs have patches on breezers, but placement of Maple Leaf emblem is not consistent. In some cases ML appears on right leg when CCM logo on left leg. But in a few cases ML patch on left leg with no CCM patch. Although on Isles breezers CCM or Reebok logo on left leg. I’ve actually always kind of liked the NHL shield on the back of the right leg of everyone’s breezers. I agree, it’s subtle, out of the way and doesn’t detract at all. I was honestly pretty happy that Reebok put their logo on the back collar…not so happy about those jerseys that they truncated the rear collar to accentuate their logo. That really upset me. Well, I know they had the black hats/yellow jerseys/black pants for game 7. I have game 5 on tape. After that….hmmm…. I think game 4 was black hats with all stripes. [quote comment=”368367″][quote comment=”368355″]OMG! That Philly-Dallas clip was so refreshing to watch. And less commercials. Better ones, too. No ED pills or boring investment ads. The pace of the game was faster, too. In game 5 of the ’79 World Series, the pitchers (especially Bruce Kison) didn’t waste a lot of time. They got the ball back from the catcher and they were ready to go. Penn State in powder blue? Is this another April Fools prank from Paul? Nah, just a practice jersey. More color vs. color in college hoops. This time it’s Ole Miss at West Virginia. Not the best shot, but if you have ESPN watch the highlights. South Alabama looked nice while upsetting Florida. [quote comment=”368388″][quote comment=”368367″][quote comment=”368355″]OMG! That Philly-Dallas clip was so refreshing to watch. Thanks for commenting on my comment – but this O’s fan can do without any references to the We are fam-i-lee debacle. Up 3 games to 1 – what the hell happened??? Those tackla pants are not from any pro team. Tacklas from pros get one logo just like everyone else, and a team logo on the other leg. [quote comment=”368390″]More color vs. color in college hoops. This time it’s Ole Miss at West Virginia. Illinois and Missouri were orange vs. old gold, too.